Available only as part of The Alien Quadrilogy. Most current DVD fans weren’t around back in the format’s formative years. Old-timers will remember the dark days in which some studios didn’t support DVD at all. Fox didn’t come onboard until late 1998, and when they did so, their efforts seemed less than spectacular. 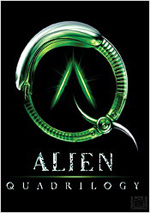 The one set that marked their gradual emergence as a strong producer of DVDs arrived in June 1999 with the Alien films. A boxed set included all four Alien movies and offered the option to acquire a fifth DVD called The Alien Legacy. The movies appeared with anamorphic enhancement – a novelty from Fox at that time – and presented a lot of good supplements. At least the extras seemed great for the time. The DVD market has changed radically since 1999, and the folks at Fox apparently felt the Alien flicks were due for a re-release. Some may cry and moan due to this “double-dipping”, but I certainly won’t. We have vastly different standards for DVDs now, and I think it’s great that Fox tried to bring the flicks up to modern standards. These come in a splendid nine-disc package entitled The Alien Quadrilogy. For full information on the individual movies, please consult my separate reviews of 1979’s Alien, 1986’s Aliens, 1992’s Alien3 and 1997’s Alien Resurrection via the links above. Please note that the picture and sound grades found at the top of this article represent an average for the four movies. Though this article covers the boxed set as a whole, I want to concentrate mainly on the package’s ninth DVD. Called simply “Bonus Disc”, this platter includes a wealth of information that splits into domains connected to the four movies. When we enter the Alien section, the main attraction is an extended documentary called Alien Evolution. The 64-minute and 21-second program presents a mix of movie clips, behind the scenes materials, and interviews. We hear from co-writer Dan O’Bannon, co-writer Ronald Shusett, producer David Giler, line producer Ivor Powell, director Ridley Scott, editor Terry Rawlings, alien creature designer HR Giger, alien head effects creator Carlo Rambaldi, visual designer Ron Cobb, and actors Veronica Cartwright, Harry Dean Stanton, Sigourney Weaver, and Tom Skerritt. In “Evolution”, we get a decent coverage of the creation of Alien. The participants go over the story’s genesis and the writing of its script, the recruitment of its director, the visual design of the creatures, its filming and its legacy. We find a particular emphasis on the shooting of the chestburster sequence and find a lot of good anecdotes and notes. On its own, “Evolution” works quite well and provides an entertaining and informative documentary. However, I must admit I don’t understand its purpose as part of the Quadrilogy. Almost no new information appears in “Evolution”, as almost every fact shows up on DVD Two’s Alien-related supplements. Sure, some of the stories are a little different and we get some mildly different perspectives, but “Evolution” doesn’t present new participants – we still get nothing from AWOL actors Yaphet Kotto and Ian Holm – and many of the tales remain the same. How many times do we have to hear that they used Nottingham lace for the alien egg? Since this bonus DVD appears solely as part of the Quadrilogy, that means anyone who owns it will already have DVD Two for Alien. That makes the program rather redundant and pointless. It’s an enjoyable documentary that works well, but it doesn’t bring anything new to the table. Next we get a 1979 promotional featurette entitled Experiment in Terror. This short seven-minute and eight-second piece includes some movie snippets, some behind the scenes shots, and sound bites from Ridley Scott about the project. Mostly he just reiterates the plot, though he also discusses his aims for the film some elements of its creation, and audience reactions. As far as promotional featurettes go, “Terror” seems decent, but it’s no better than that and it merits inclusion only as a historical curiosity. After this we discover a 15-minute and 39-second Ridley Scott Q&A. Filmed on September 14 2001 after a Hollywood screening of the film, the director gets into his recruitment for the movie, cast rehearsal and character development, sets and models, working with Jerry Goldsmith and Lionel Newman, marketing the flick, and a few other topics. Some moderately new information pops up here, but the “Q&A” seems somewhat lackluster, probably because of bad timing. Given the national state of shock in the days after 9/11, it comes as little surprise that the proceedings appear a bit somber and low-key. In the Special Edition Laserdisc Archive, the DVD presents virtually all of the elements that first appeared on the 1992 boxed set release. That sucker packed a great level of information, and we find that material reproduced here. Most of this comes via stillframe text and art, but a smattering of video elements appear as well, such as a then-contemporary interview with Scott, test material, and deleted footage. However, it’s the text that creates the biggest attraction here, as those elements allow a depth that the video supplements elsewhere can’t match. The “Archive” gets into its topics in a rich and full way that makes this a very valuable addition. The Alien domain ends with both the film’s theatrical trailer and its teaser plus two TV spots. Then we head to the Aliens area and its smattering of extras. The most significant component comes from its Special Edition Laserdisc Archive. All my comments about the similar feature for Alien apply here, as the section faithfully all the goodies found on the 1991 Aliens laserdisc boxed set. It’s a fabulous collection that provides scads of excellent information. Otherwise, the Aliens section presents four trailers and a TV spot. When we head to the Alien3 domain, we get five trailers, seven TV spots, and an advance featurette. The latter runs a mere 175 seconds as it shows movie clips and features sound bites, mostly from Sigourney Weaver. These tell us little and the piece exists solely to promote the flick. Mystery of the moment: why’d the DVD bother with this brief ad but omit the decent 21-minute program that appeared on the 1999 DVD for Alien3? Speaking of missing components, the Alien Resurrection domain fails to include the featurette from its 1999 DVD. However, that’s not much of a loss, as that four-minute clip was little more than a glorified ad. This area presents only a teaser, two trailers, and four TV spots. The “Bonus Disc” winds up with some materials that don’t relate specifically to only one of the movies. Of most interest is a featurette called Alone in the Basement. In this 16-minute and 57-second program, we meet Bob Burns, a collector tells us how he developed his interest in the field and how he started. Burns then goes through how he got into the Alien flicks and takes us on a tour of some of his treasures. Burns remains enthusiastic and gleeful about his hobby, and his enjoyment becomes infectious. (Of course, this is affected by some jealousy – I’d kill for a collection one-tenth the size of Burns’!) It’s a fun story and this program conveys it nicely. Next we find a Dark Horse Cover Gallery. This includes 110 shots of comic book covers along with synopses of the stories and a few other notes. It seems like a good collection that gives us a solid glimpse of the series. For fans with DVD-ROM drives, the fun continues. With that connection, we can check out a “Interactive Script”. Actually, the DVD’s booklet bills this as a “Script to Screen Comparison”, but that’s not really accurate. That title implies that you can watch the movie while you read the text. The “Interactive Script” doesn’t work that way. It includes scripts for all four movies but simply shows still photos to represent the various scenes. Even without the full-motion film footage, this remains a cool extra that lets us get a look at the text. Finally, the Quadrilogy includes a nice 24-page booklet. It provides plot synopses for all four movies, discussions of the different extended cuts, chapter indexes, and supplement listings. The booklet provides a nice reference for the package. For the most part, this “Bonus Disc” doesn’t seem like anything tremendously special. The laserdisc archives are excellent, but for some of us, they’re old news. It’s great to get them on the DVD, but they don’t present anything I don’t already have, and the prior Alien and Aliens DVDs already included a lot of their information. However, as examined as part of the overall package, the “Bonus Disc” acts as the icing on the cake. The full nine discs of the Alien Quadrilogy present a fairly exhaustive examination of the four Alien flicks and serve to consistently entertain and inform. Fox gives the movies and the extras terrific treatment that should please Alien fans. As I noted at the start of this review, my grades for the Quadrilogy represent averages of those for individual films’ DVDs. One exception occurs, however, as I didn’t do it that way for the extras. I have three of three four movie sets “A”’s and awarded only Aliens an “A+”. So why did I give the overall package an “A+” when the average more closely resembles an “A”? Because the whole seems somewhat greater than the sum of its parts. The Quadrilogy is a real behemoth of a set. It so richly and dynamically examines the Alien series and does so in such an ambitious way that I thought it deserved the highest honors for its supplements. It’s a wonderful release. I already dealt with recommendations that relate to the individual movies, so the question becomes who should purchase the Alien Quadrilogy as a whole. The Quadrilogy hits shelves in early December 2003, but individual 2-DVD releases of the four films will appear at the start of 2004. That complicates things for some fans. In my case, I’d want to own the Quadrilogy. I like all four movies so I’m excited to have the whole package. Clearly anyone who enjoys the series of flicks will want to get a copy of the Quadrilogy. The situation becomes iffier for folks who like only three – or two, or one – of the movies. For them, individual purchases probably make more sense. One main incentive to get the Quadrilogy comes from the exclusive ninth DVD. The “Bonus Disc” includes some nice material, but not enough to make it worth the extra cost incurred to buy a movie – or two, or three – that you don’t like. Actually, if you like three of the four flicks, it might still make sense to get the Quadrilogy, especially if you get it for a good price; it’s possible you could find it for the same cost that three separate releases would equal. Fans who buy the flicks separately will have one advantage over owners of the Quadrilogy: the packaging. Presumably, the individual two-DVD releases will come in standard cases, whereas the Quadrilogy presents its nine discs and booklet in one enormous foldout digipak. This extends to over five feet and it makes access of some discs very awkward. You can get to the middle platters with reasonable ease, but when you want to move to DVDs One or Nine – or the booklet, which is at the far right end – it becomes a real pain. With all the required opening, closing, and manipulation, expect the cardboard package to get worn pretty quickly. Why Fox chose to use this awkward and clumsy arrangement I can’t imagine. Apparently the Region Two Alien set uses a book-style set-up similar to that of Paramount’s Star Trek: Deep Space Nine releases. That presentation offers much greater ease of use, as one can quickly and simply flip between its “pages” to access different discs. The Region One Quadrilogy is impractical and unwieldy. Despite that issue, I remain highly impressed with The Alien Quadrilogy. It helps that this set offers my all-time favorite movie series. To get all four films presented with best-ever picture and sound, alternate versions plus the theatrical releases, and many, many hours of extras literally is a dream come true; even just a few years ago, I never would have imagined that we’d receive such a fantastic set. Even with the minor caveats, I whole-heartedly recommend the Alien Quadrilogy to fans of this marvelous film series. It’s one of the strongest DVD releases of any kind that I’ve yet seen.